Four Ways to Remodel a Home for Aging in Place - Home Care in Raleigh NC by Affordable Family Care Services, Inc.
A 2014 study by AARP found that 87 percent of Americans 65 or older want to remain in their current home. For that to happen, the home may need to be remodeled to meet the changing abilities of a senior. Here are our ways you can remodel your parents home to help them age in place. You don’t want your mom or dad climbing on a chair to reach something on the top shelf of a cupboard. Some modern kitchen designs have gotten rid of overhead cabinets. Instead, all the cabinets are below the counter level. There are units that have pull-out shelving to make it easy to retrieve things. You can put up magnetic strips to hang utensils and knives right on the wall in an organized manner. Wall-mounted spice racks and coffee cup hooks put commonly used items at eye level. Some smart devices are ideal for aging at home. Video doorbells let seniors and their family members see who is at the door before they open it. Smart thermostats alert people if the temperature in a home is too cold or too hot. There are also voice-activated devices that can turn on lights, music, and offer reminders. You can use smart speakers to remind your parent to take medications, get to an appointment on time, or have another glass of water. Grab bars in a bathroom are important for support. Some people find them unsightly. Look for the grab bars that pair the grab bar with a towel holder. The dual-purpose grab bars provide the protection seniors need while never taking up extra space. Hardwood floors, laminate, tile, and linoleum are slippery when you’re wearing socks. In the winter, it’s unlikely your parents will want to walk around in bare feet. Carpeting is safer, but it can trap dirt and be harder to keep clean. Look at some of the newer forms of flooring that are slip-resistant. One option is vinyl plank flooring that looks like hardwood but contains slip-resistant materials. This type of flooring also resists water, so it’s very easy to wipe up if something spills. 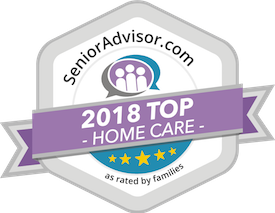 In addition to changing the home design and amenities, you should look into senior care services. Your parents may need caregivers to help them with activities of daily living. Things like medication management, driving, and preparing meals can be harder to handle as chronic conditions like arthritis, dementia, or eye disease set in. Call a senior care agency to find out other ways to help. Owner at Affordable Family Care Services, Inc.
Donnie graduated from Elon University in 1987 with a B.S. in Business Administration and Marketing.Has worked in a variety of medical fields - a hospital equipment company, medical equipment company, and home care.Opened Affordable Family Care Services in 2006 – it has grown to include upwards of 125 caregivers and many award-winning programs.Married to Lesley, one son Spencer who attends North Raleigh Christian Academy.Avid golfer and fisherman.